I am using Tomboy 1.60 from the ubuntu package sources and Ubuntu Natty Beta 2 with Unity. 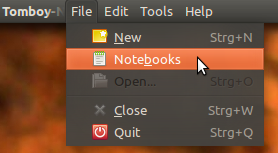 The submenu is not shown (check Tomboy_Unity.png attachment), it is not possible to create a new notebook/to create a new note in a specific notebook. 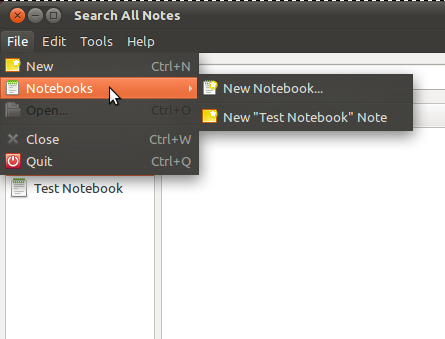 Just in case anyone is stuck for a workaround on this it is possible to create a new notebook by making a new note and clicking the Notebook button in the notes toolbar, this has a New Notebook option. This seems to be a design decision rather than a bug. Alemann, what makes you say it seems to be a design decision? If so then it should have been removed from the menu. It is still failing in Raring alpha. Oops. I didn't notice that the note-search window (and consequently, the notebook panel) has to be open before the menu is even displayed. Seems like a bug, then.